Here are some pictures from the Branch Meeting and Reception for John Twigger at The Gateshead Bowling Green Club last Saturday. The RAF Officer is branch member Mick Soulsby who has recently been commissioned in the RAF VTR. As well as his civilian occupation as a Sergeant in Northumbria Police Traffic department. He is also an instructor in the Wideopen Air Cadets Squadron. Also in the picture standing behind John is serving member Warrant Officer Rab Motherwell. The Associate Members provided us with another excellent buffet and we were pleased to welcome members from the Royal British Legion and Newcastle Branch of the Royal Air Force Association. 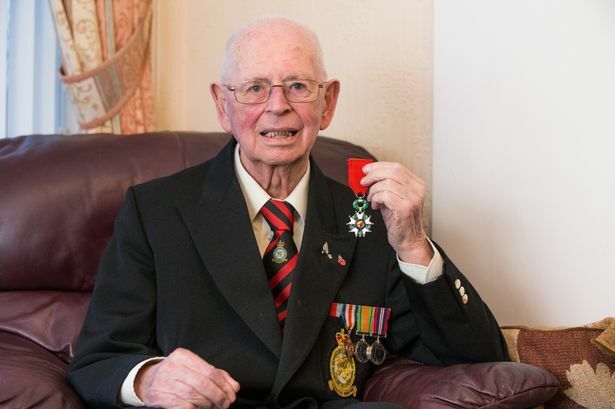 A war veteran has spoken of his pride after receiving France’s highest military honour. John Twigger, 92, of County Durham , was appointed to the rank of Chevalier in the Ordre National de la Legion d’Honneur. The medal was awarded in recognition of the part he played in the liberation of France. Born in 1923, he worked as a messenger for the fire service in his native Birmingham at just 15, enduring “night after night” of bombing during the blitz of Coventry. John, now of Newton Aycliffe, recalled: “My job was to take messages on my bicycle from fire engine to fire engine. “I remember one night of heavy bombing, I had to get under one of the engines and spent the night there. After the bombing they thought I had been killed until someone spotted my boots under the engine. “I joined the RAF in 1941. I wanted to fight the people who were doing the bombing and I wanted to serve my country. I started off as a drill and PT instructor alongside comedian Max Wall and footballer Stanley Matthews. I transferred to the RAF police. “I went to France on D-Day plus one, landing on the Averanches beaches. I got through and about three days after D Day, a sergeant said to me ‘can you drive an ambulance?’ and I said ‘I have never driven one’, but I had to take it around a field. Madly in love, John and Connie both served in Arnhem, where she watched parachutes come down as John witnessed “the grisly aftermath”. They were happily married for 65 years, until Connie death six years ago, aged 87. Their son John, 66, lives close to his dad. John sold saunas to the likes of Shirley Bassey and the Rothschild family, holding the UK franchise for Ranta Salmi, until he retired at 80. He is now a great grandfather. In a letter accompanying the medal, Sylvie Bermann, of the French Embassy, wrote: “As we contemplate this Europe of peace, we must never forget the heroes like you, who came from Britain and the Commonwealth to begin the liberation of Europe by liberating France.